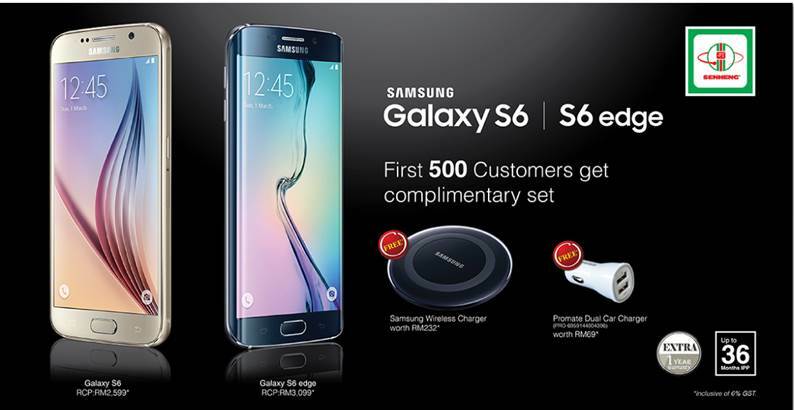 The Samsung Galaxy S6 and Galaxy S6 edge have finally been launched in Malaysia. If would like to get one for yourself, you may preorder them from Senheng and senQ online or from their outlets nationwide starting tomorrow, 3 April 2015. As always, the store will throw in freebies for early birds worth up to RM301, as well as a 1 year extended warranty. As expected, the Samsung Galaxy S6 and Galaxy S6 edge retails at RM2,599 and RM3,099 respectively. Senheng is offering both devices in all the available colours – white, black, gold, and green (Galaxy S6 edge) / Teal (Galaxy S6). Sadly though, Samsung is only launching the 32GB variant of both devices here in Malaysia at the moment – pricing and availability for the 64GB and 128GB variants are not known yet. As a launch promotion, Senheng will be offering two freebies for the first 500 orders – a Samsung wireless charger worth RM232, as well as a Promate dual car charger worth RM69. On top of that, Senheng also offers an extra one year warranty on top of the regular warranty offered by Samsung Malaysia. You can also opt to pay via Easy Payment (EPP) up to 36 months with 0% interest. Interested? Visit Senheng for more information or check out a Senheng or senQ outlet nationwide starting tomorrow. The prices mentioned are already inclusive of GST.